From Left: Angela Wu, Pamela Dowsett, Felix Brookie, Enshean Lin, Jessica Kidd and Annie Hunt. Spring, summer, autumn, winter will dance past in an hour of music and poetry at Sarjeant on the Quay, Sunday 3 September at 4.30pm. Te Awa String Ensemble and two soloists, directed by Pamela Dowsett, will present “The Four Seasons” by Vivaldi as part of the Musicians at the Sarjeant fundraising for the redevelopment of the Gallery in Queens Park. John Scott will accompany the performance with sonnets attributed to Vivaldi. 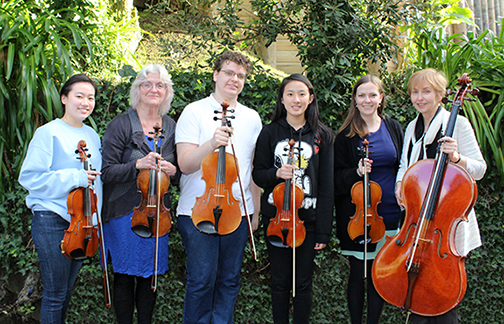 The ensemble, recently formed by Ms Dowsett, who plays the violin, includes Sarjeant Gallery Assistant Curator, Jessica Kidd (violin), Annie Hunt (cello) and Felix Brookie (viola). The soloists Angela Wu (16), and Enshean Lin (14), are two of Ms Dowsett’s pupils. An internationally experienced performer, freelance teacher and examiner, Ms Dowsett moved to Whanganui from Levin with her husband Colin in December last year. Mr Dowsett is a guitarist and they play gypsy jazz together. Originally from Brisbane, Ms Dowsett has a Master Diploma in piano and violin from Queensland and has studied in Brussels, Switzerland and London. She was soloist and principal player with Australian symphony orchestras and has performed in Singapore, Paris, Bonn, Rome and the United Kingdom. She lectured for a number of years at Otago University and taught at three conservatoires in Brittany, France where she and Mr Dowsett also ran a B&B from a 200 year-old stone cottage. She is currently teaching at Wanganui Collegiate, as is Ms Hunt, and gives private lessons. Ms Dowsett said she has formed a string ensemble wherever she has lived and that her most advanced students have featured as soloists. Her student soloists for “The Four Seasons” are both from Taiwan. When Ms Dowsett came to a concert given by Ingrid Culliford at the Sarjeant she met Jessica and they “hatched the plan together” to play at the Sarjeant. Ms Dowsett said she enjoys the atmosphere and the simplicity of life in Whanganui.